The capsule could eventually be used in people to find signs of ulcers or disease. The capsule was tested in pigs and correctly detected signs of bleeding, researchers at the Massachusetts Institute of Technology reported Thursday in the journal Science. At more than an inch long, it will have to be made smaller for testing in people. But the results suggest the capsule could eventually be used in people to find signs of ulcers, inflammatory bowel disease, or even colon cancer, the researchers said. It’s the latest advance in a growing field of sensors that can be swallowed or worn to monitor our health. Pills equipped with cameras, thermometers, and acidity gauges already look for disease and track digestion. Last year, a psychiatric medication that alerts doctors when it’s taken won US approval. Stick-on skin monitors for recovering stroke patients are in the works. 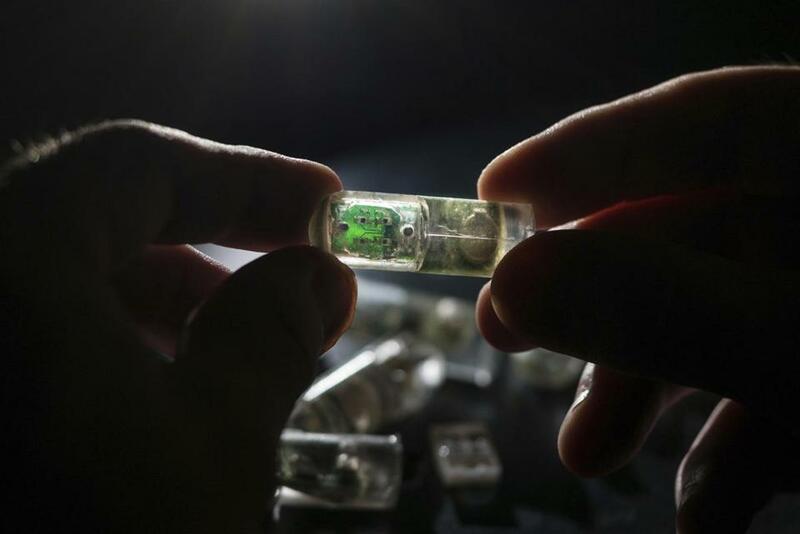 ‘‘The work is yet another step toward showing the great promises of smart, ingestible capsules,’’ said Kalantar-zadeh. Shrinking the capsule to a normal pill size could be achieved by combining its three electronic chips, said coauthor Phillip Nadeu. Data encryption will be needed to protect patient privacy. And it’s meant to be used once, so they’ll need to make it flushable, coauthor Mark Mimee said. As labs discover DNA with new sensing powers, the capsule could be customized to diagnose multiple conditions. Coauthor Tim Lu speculated that future patients could swallow a capsule ‘‘once a week or once a month’’ to screen for early signs of cancer instead of getting a colonoscopy.